A car blocking the bike lane at Pearl and 17th last November. 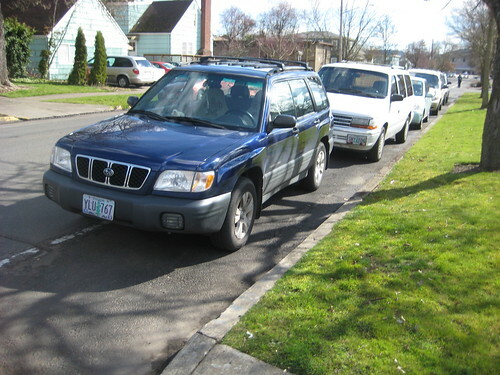 The Eugene Parking Service Office has determined that the current parking fine structure is not effectively motivating drivers to “make better and safer parking decisions” such as not parking in bike lanes, sidewalks, or in front of driveways. As a result, fines will be increased for parking in bike lanes from $25 to $40, and the fine for parking on sidewalks and in front of driveways will be increased from $15-$25. The new fine structure will come into effect May 3rd, 2010. 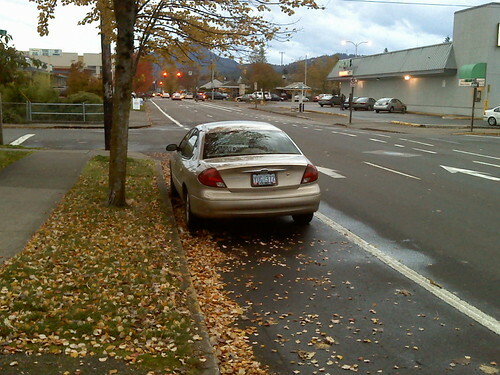 Is it refreshing that the City of Eugene is beginning to take dangerous parking practices seriously, and we can hope enforcement will also be increased. When I reported a car parked in the Pearl St Bike Lane last November during rush hour, I was told that it would take several hours for an officer to come and ticket the car. Luckily, no-one was injured during the wait (as far as I know). With the UO arena parking district coming into play on September 1, we will have more resources out on the streets till later (6:00 PM and beyond). Plans are not ready for public yet, but there will be increased availability to enforce neighborhood traffic issues. Yes, I have been listening to the bike, pedestrian, and neighborhood communities, which resulted in increased fine levels and forthcoming enhanced enforcement. I am also slowly taking on centralizing more of the downtown [management of] bicycle parking areas too (as it comes about). In February, 2010, the Parking Services Office performed an analysis of current parking fines. Through this process, Parking identified several areas where fine amounts were out of alignment with other jurisdictions and not effective at correcting prohibited parking. As a result of the analysis, Parking Services submitted a request to Presiding Judge Allen to review the current rate structure and determine if an increase would be appropriate. After careful consideration, including the review of comparable parking fines from other local entities, an informal survey of enforcement staff to determine the effectiveness of the citation amounts and recognizing a need for fine increases to protect neighborhoods, Judge Allen confirmed that several parking fine changes were appropriate. The current parking fine changes will become effective May 3, 2010. 1. Neighborhood Traffic Safety – One of the primary parking and safety concerns for neighborhoods that have City enforced parking zones (downtown to campus) is pedestrian and bicycle safety from parked vehicles. This concern is voiced by residents and neighborhood associations, and effectively enforcing laws that affect bicyclist and pedestrian safety is a key strategy in the Bicycle and Pedestrian Strategic Plan (Strategy 3.1). The current level of fines for these violations, such as parking on sidewalk, in yellow zones, or in front of driveway, has not motivated drivers to make better and safer parking decisions. The average fine amounts will increase from $15 to $25. Parking in a bike lane is also a safety concern for bicyclists, and the fine will increase from $25 to $40. 2. Meter/Time Limit Zone Violations – The current fine amount for violations of meter and time limit zones will increase from $12 to $16. This increase is $1 greater than parking fines in Salem and $1 less than a current University of Oregon fine. The last three fine increase were in 2006 ($12), 1993 ($10), and 1986 ($5). If you have any questions or concerns please contact either of us. 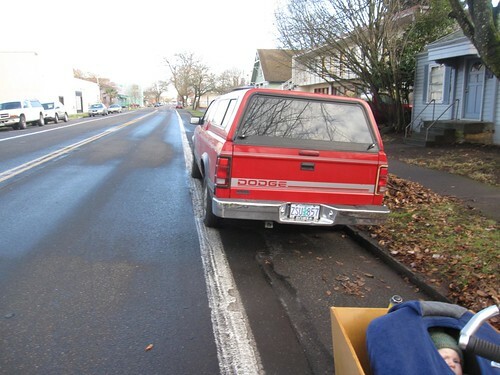 And now for your viewing enjoyment: The Bike Lane Park of Shame! 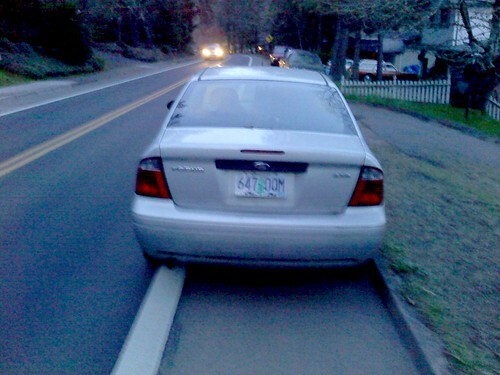 Car parked in the downhill bike lane on Fox Hollow Rd. Yikes! Does the statute for blocking the sidewalk include motorists who park in a driveway, but completely obstruct the sidewalk? This seems the most common way that people block the sidewalk.